Time theft and inaccurate timekeeping of employee hours can cost companies dearly. There are times when the incorrect hours reported by an employee are honest mistakes but there are also instances when employees are deliberately trying to get paid for time that they did not work. These dishonest occurrences are actually time theft and can be just as dangerous to your bottom line as the electronics department cashier who walks out with a pair of $80 headphones under her coat or a roofer who reports a $400 nail gun as stolen when he actually pawned it. The various methods used generally fall into four categories. Aptly named buddy punching is when one employee punches the time clock for another employee who isn’t actually at work. Maybe they make it look like their friend arrived on time when they didn’t, stayed later than they actually did, or took a shorter lunch break. This type of time theft can even happen when hours are reported in an online portal because employees can simply share their personal login information. This type of time theft occurs when an employee deliberately misreports their hours at work. When hours at a business are reported manually, this type of stealing time is more likely to occur (both intentionally and unintentionally). No matter the motivation behind this, overestimating even a few minutes each day can really add up. Any small business owner could think of a hundred better things to do with that almost $7000 each year. Advertise more! Upgrade equipment! Expand your social media presence! Invest in an automated Workforce Management System and biometric time clock and still have money left over for a nice vacation! Not only are breaks important because they are mandated by law in many states, breaks can be the perfect solution for employees who need to do a few minutes of personal business on company time. An employee who is making an eye doctor appointment when they should be working can be reminded that these activities are better done during their break. However, employers who offer regular breaks without having their employees clock out may be setting themselves up for frequent time theft by employees. Breaks are easy to stretch out an extra five or ten minutes, and this can happen multiple times a day with multiple employees! The expense increases surprisingly fast due to exponential math: number of occurrences multiplied by total number of minutes stolen multiplied by number of employees. So what can employers do to eliminate employees stealing time from the workplace? Good management, thorough training, and implementing an automated time and attendance system at your business are the best ways to reduce time theft. Employees run the gamut from highly self-motivated to those in need of guidance at every turn. Having clear expectations from day one will help employees know how best to use their time, even when there is no immediate need for their primary duties. For example, in retail settings, managers should tell workers which tasks should be completed when customers aren’t requesting their assistance. A statement such as, “If there are no customers that need your help, try to tidy up the check-out area or do a quick walk-through of the sales floor and straighten up items on the shelves.” In a manufacturing environment, the manager can create a hierarchy of duties that workers can perform when a machine is down, such as stocking materials or helping the shipping department with their constant backlog. Having a list of alternative tasks where employees can see them can also be helpful to keep workers productive while they are on the clock. Also, stress the seriousness of time card fraud. Some employees might not think it’s a big deal to let their friend leave early and clock out for them later. Maybe their friend promises they’ll make up the time next pay period and their reason for doing so seems legitimate. But employers should be clear that this is fraud and they are essentially stealing from the company. If there is a central area where employees clock in, it would be helpful and appropriate to hang a sign reminding them to be honest and accurate with their time reporting. Make sure break time is well-defined. Does the break start when they leave their desk or register? Or does it only count when they are in the break room? By the way, a sign with the break policy spelled out would be a wonderful decoration for any break room! Whenever company rules are broken and no consequences occur, it is assumed by employees that that rule isn’t very important. This doesn’t mean that every consequence needs to be severe, but there should be a clear program of progressive discipline. These graduated levels to discipline allow managers to step in early-on, before a problem becomes a fireable offense. They can even foster better communication between employees and management. Progressive discipline is also an invaluable way to keep a record of issues if an employee does need to be terminated. 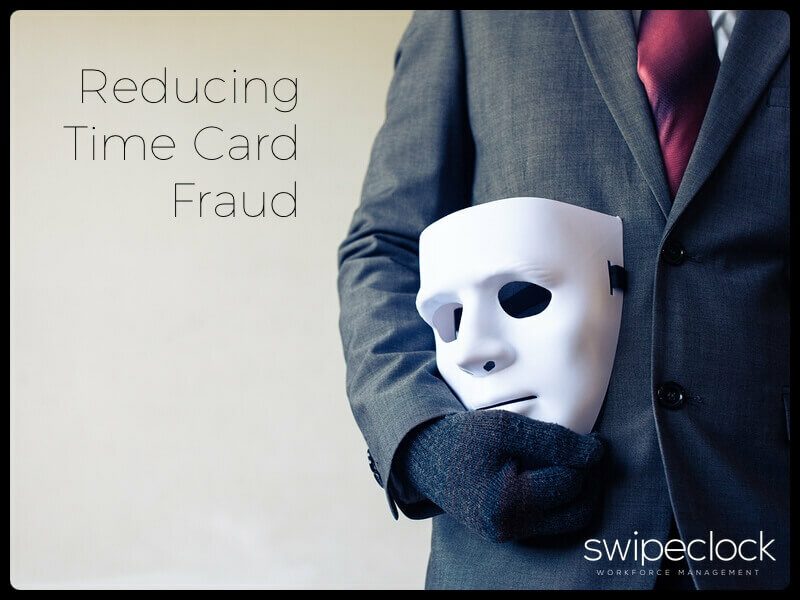 Automated Workforce Management systems are the best way to manage time and attendance at your company and prevent time card fraud. The SwipeClock Workforce Management Suite includes TimeWorksPlus. TimeWorksPlus is a cloud-based time and attendance solution that allows for much more accurate timekeeping than manual systems. The first step in eliminating time theft is accurately capturing employee shift start and end times. TimeWorksPlus provides businesses with a variety of ways for their workers to punch in and out. Employees can log time with one of our plug-and-play biometric time clocks or on their tablets, mobile phones, laptops, or desktop computers. This eliminates the need for employees to simply guess when they arrived or when they began their online tasks, and owners will stop paying for time that they weren’t working. At SwipeClock, we help businesses save time and money with automated employee timekeeping and scheduling.